Posted on May 10, 2013 by Susan H.
May is Food Allergy Awareness Month in Canada and Sunday is Mother’s Day…this post aims to honour them both. As a mother with two teenaged boys with multiple food allergies…Anaphylaxis Canada’s Youth Advisory Panel’s (YAP) 31 Tips for Parents – From Teens (click here) has encouraged me to learn more about what allergic youth of today need. To do so, I have been visiting their site…Why Risk It?…Where Real Life And Allergies Collide. Why Risk It? is a great site for allergic youth to learn more about how their peers with food allergies are living/coping/dealing with their food allergies through real life stories of their own. With two teenaged boys with multiple food allergies in the house…forever on the look-out for something tasty to eat…I was curious to check out the recipes on the Why Risk It? Blog. I must say…I was a bit disappointed to find only 3 recipes. Out of the 3 recipes, only one stood out…I love a recipe with a good story. The post was written by Arianne. Due to Arianne’s peanut/tree nut allergies and her brother’s egg allergies…Halloween treats were off limits at her house. 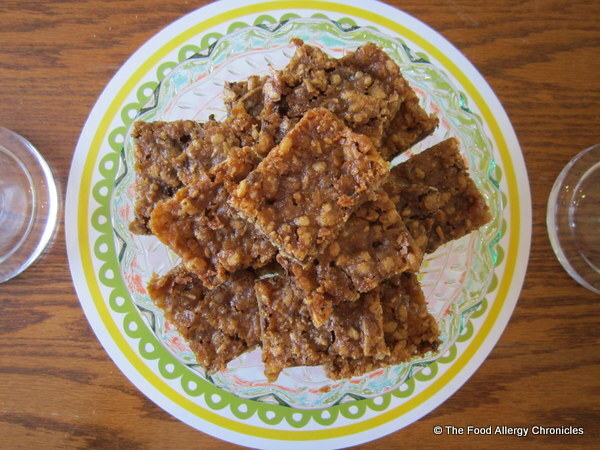 Lucky for Arianne and her brother, her mother learned to make special allergen friendly Halloween treats, such as Scream Bars, for her and her brother to enjoy so they would not feel left out. Click here for the original story and recipe. I have adapted Arianne’s, already egg and peanut/tree nut free recipe, to be dairy free to accommodate my eldest son’s dairy allergy. 1) Replace the 1/2 cup butter with Earth Balance Vegan Buttery Sticks or Earth Balance Soy Free Buttery Spread for a soy free version. 2) Cream the room temperature Earth Balance before adding the brown sugar…cream them together before adding the flour. 3) Measure all the dry ingredients, excluding the coconut and rice krispies, in a large bowl. 4) I used Adrianne’s 2 egg replacement: I measured 4 tbsp. of warm water in a little dish…just before I was to add it to the mixed dry ingredients, I added the 1 tbsp. of baking powder. I stirred it all together while it fizzed then quickly added it to the dry ingredients to combine. I then added the coconut and rice krispies. A sweet, crunchy, decadent treat! As Mother’s Day is this Sunday…I would like to take the time to thank my mother for encouraging me to help in the kitchen…she gave me the skills I needed to be creative in the kitchen, instilled in me a love for good ‘real’ food, and sent me off into the world with a pleather of great recipes…many of which I have adapted to share with my family today. As a mother myself…I hope I can do the same for my boys. 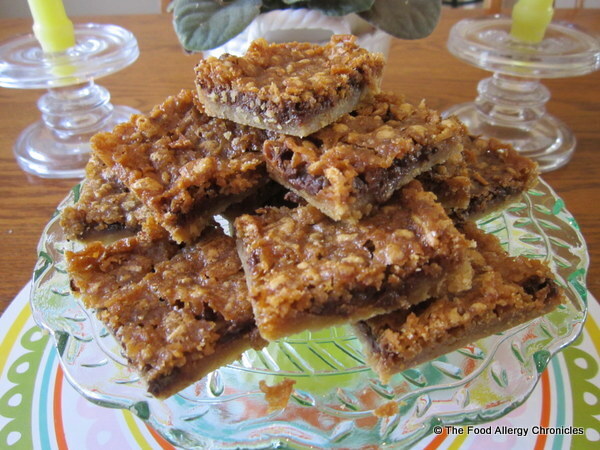 This entry was posted in allergies, baking, dairy free, egg free, May Food Allergy Awareness Month, multiple food allergies, peanut/tree nut free, soy free, squares and tagged anaphylaxis canada, Dairy Egg Soy and Peanut/Tree Nut Free 'Dream Bars', Earth Balance Soy Free Buttery Spread, Earth Balance Vegan Buttery Sticks, may is food allergy awareness month, Scream Bars, Why Risk it? by Susan H.. Bookmark the permalink. Hmm. I may have to give these a try. Happy Mother’s Day! Enjoy your day relaxing!